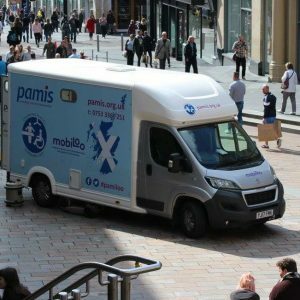 PAMIS acquired the first Scottish Mobile Changing Places toilet in 2017. This vehicle, the pamiloo, can now be used by families and used at leisure events held by PAMIS to provide fully accessible toileting facilities. Thousands of people with complex needs across Scotland are unable to attend events or visit outdoor venues due to the lack of appropriate toilets. While locations sometimes offer ‘accessible toilets’, these are not suitable for people with complex needs who need specialised equipment and additional space. PAMIS acquired the first Scottish Mobile Changing Places toilet, this vehicle – the pamiloo can now be used by families and used at leisure events held by PAMIS to provide fully accessible toileting facilities. The pamiloo is available for hire for Pamis partner events and events requested by pamis families. Mobiloo have mobile changing places facilities. Check out their website here or call 0300 030 125. We are still fundraising to pay for the cost of the vehicle, and very much appreciate any support. You can support the campaign on JustGiving by donating or starting a fundraiser below. You can also take part in our fundraising inspired by our 25 anniversary year – The PAMIS Challenge 25. We are looking for 25 teams from across Scotland to turn £100 seed money into £1000 for the Pamiloo. How you do it is entirely up to you! You can be as creative as you like. You can start your challenge on a date of your choosing and then you have 12 weeks to complete it. If you would like to take part, or would like more information, please contact our Fiona Harper from our fundraising team on f.k.harper@dundee.ac.uk or call 01382 385154. You can also raise money for the Pamiloo by taking part in a Kiltwalk event – these are taking place in Glasgow, Aberdeen, Dundee and Edinburgh. Find out more about how you can take part for PAMIS here. You can keep up to date will all campaign news on the facebook page for pamiloo. Share the campaign with friends! To see availability and to make a reservation, please click here.